Born in 1969 in Milan, Loris Cecchini‘s sculptural practice could be mistaken for that of an utopian architect. For the last 15 years, the artist has been obsessed with a deconstruction and a reconstruction of everyday realities with an accent on the banal and the absurd. 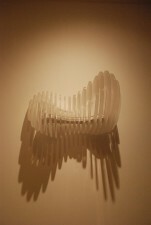 Through an enormously varied use of plastic components, - moulded urethanic rubber, silicon, laser-cut plexiglass, thermo-moulded PETG – the list is long, the artist explores the process of casting in a laborious way to reach Zen-like observations of the outline of things, giving equal weight to forms and voids. The scale of his objects varies from the large to the miniature, its imagery often existing twice in different formats. Some large molecular looking sculptures, created in Beijing recently, made with thousand of white plastic spheres can find themselves reproduced in small bubble-like transparent wall objects, called Quasi-transparent Thoughts. Like an architect, he also makes models. Presented on a plinth is a miniature sculpture of what looks like an utopian tree house, a giant clear plastic bubble-shaped house, looking like able to accommodate human life in the aftermath of an environmental disaster. Digitalisation plays an important part in his practice. His interests in abstract forms and plastic textures allow him with computer generated images to extend his imagination to situations which allow for a gentle ‘rewinding’ of constituting elements, if necessary. Since his concerns often deal with parallel realities (like in the film the Truman show), digitalisation is a perfect tool for metamorphosing one plane of thought onto another. 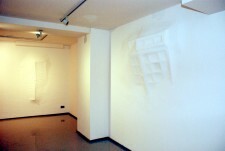 As such, in a series of wall works entitled Transparencies, which are thermo-constructed collages, varied abstract forms from previous installations overlap with new imagery. The artist has always taken a keen interest in rubber, for the technology allows him to make replicas of everyday objects like bicycles, computers, chairs but in a soft material therefore taking out so-to-speak the back bone of the objects, making them look absurdly limp, a ghost of the original. 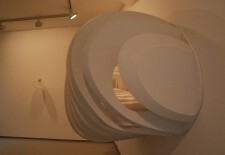 The transfiguration of an object into a dematerialised ghost is apparent also in a new large wall installation where a window protrudes out of a wall in a ghostly white appearance. Through dematerialisation of realities or transfiguration, Cecchini plays with the real, the dream and the apocalypse in interchangeable ways, stretching the definition of sculpture in a continuous manner. Solo exhibitions in the last three years have taken place at the Palais de Tokyo in Paris (2007) and P.S.1 Moma New York (2006). He is represented by Galleria Continua in San Gimignano and Beijing.